Scouting and documenting venues for performing arts in the Waterville and surroundings. 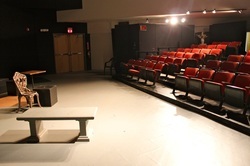 Winslow High School Theater: seats 210; part of Winslow High School; residential area; no surrounding businesses. Seats 60. Visit the Opera House website for more photos.